First True Contact Adhesive in Aerosol Form. It has Exceptional Resistance to Plasticizing Oils. Bonds Rubber and Supported Vinyls Better than Many Typical Bulk Neoprene Contact Adhesives. It has exceptional resistance to plasticizing oils. 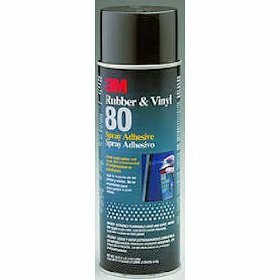 Bonds rubber and supported vinyls better than many typical bulk neoprene contact adhesives. It has true neoprene contact adhesive strength and high heat resistance over 200 degrees F (93 degrees C).